The Event cancel or keep? Of all the new shows this season, it seems like NBC has the highest hopes for The Event. How did the new show do in the ratings? Will it be the next Lost or the next FlashForward? 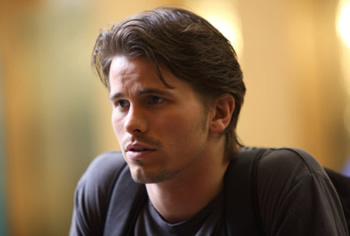 The Event follows Sean Walker (Jason Ritter), a young man who’s investigating the mysterious disappearance of his girlfriend. He slowly begins to uncover the biggest cover-up in the history of the United States. Others in the cast include Sarah Roemer, Laura Innes, Ian Anthony Dale, Scott Patterson, Clifton Collins Jr., Taylor Cole, Lisa Vidal, Bill Smitrovich, Zeljko Ivanek, and Blair Underwood. The first episode attracted an average 3.6 rating in the 18-49 demographic and 10.9 million total viewers. It was in third place in both areas, though it did tie CBS’ Mike & Molly for second place in the demo in the second half hour. What do you think of The Event? This was a big improvement over last season’s Heroes premiere and built on the Chuck lead-in by 80%. That’s impressive. What’s more, viewership grew as the hour progressed, meaning that people stuck with it and new people even joined in midway. While this performance is positive, it’s not as big a start as the network wanted. The real test will be to see how well The Event holds up over the next few weeks. AS you may remember, ABC’s FlashForward started with very healthy numbers but viewership dwindled each week and it was ultimately cancelled after one season. But, what do you think? Do you like The Event? Is it confusing or intriguing? Will you keep watching or should it be cancelled? PLEASE keep THT EVENT going!! I think it’s a great program, I want to see what happens next. PLEASE don’t cancel it!!! I love this show!!! It’s a keeper. It’s very intriguing. I want to know what happens next. This show is great!! NBC should reconsider bad mistake on their part!! Keep The Event YES!! But it looks like NBC IN THEIR RIGHT MINDS ARE GOING TO CANCEL THE SHOW. I guess they still want to keep their ratings low for them. Please keep the event, this is one my only favorite shows. ive been watching it weekly since episode 1! Almost 302,000 people on Facebook who likes the event! Not enough for a Season 2?